Hover the cursor over the dots on the map for more information on each location. This is the site of Gerald Ford's father's paint business, which opened in the fall of 1929. The business was later operated by Ford's step-brother Richard. St. Marks Episcopal Church is located right downtown, and is where the Ford family attended services throughout Jerry's childhood. 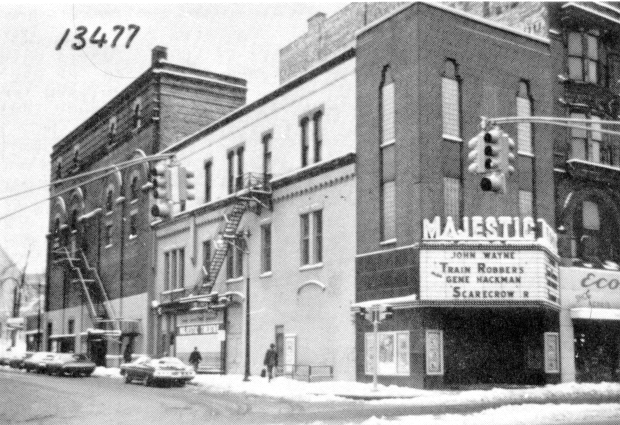 The Majestic Theater, at the corner of Library Street and Division, sponsored the popularity contest that Jerry won during his senior year of high school. 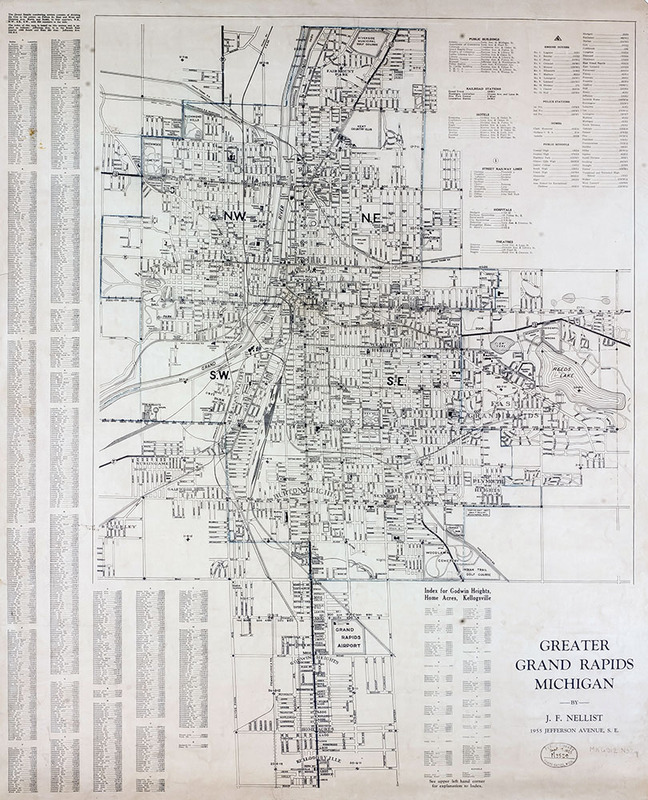 Photo courtesy of the Grand Rapids Historical Commission. Here, on Weston, east of Division, Ford Sr. taught Junior to swim. Junior eventually joined the YMCA swim team in high school. Grand Rapids Wood Finishing Co.
On Ellsworth Avenue SW, Gerald Ford Sr. worked here as a salesman from about 1923 until he and a chemist bought the company's paint and varnish division in 1929. The company itself was in business till 1990. 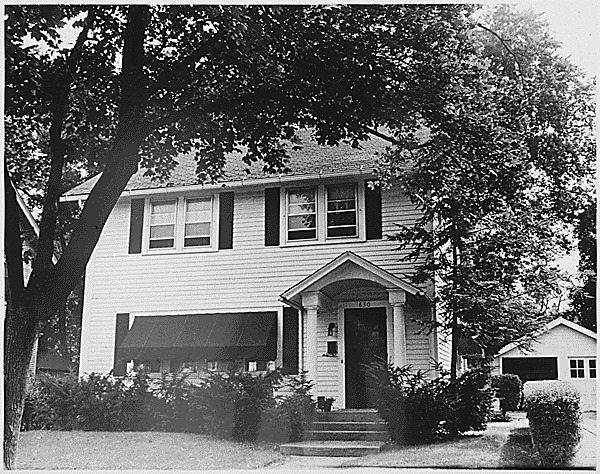 The first home that Gerald Ford Jr. lived in as a child in Grand Rapids, it was duplex split with the mother and sister of Gerald Ford Sr. 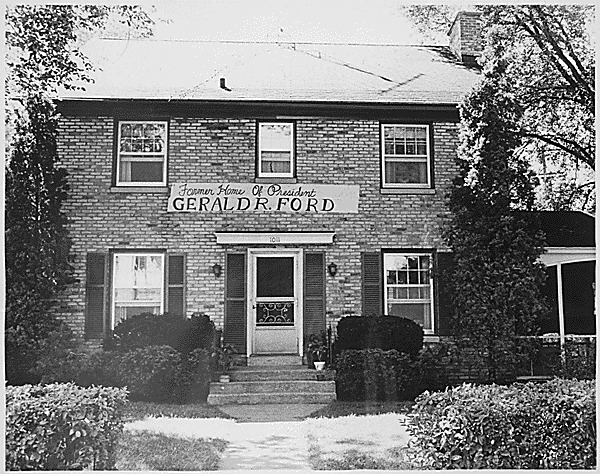 The officially recognized boyhood home of Gerald Ford, the Ford family lived here from 1923 to 1930. 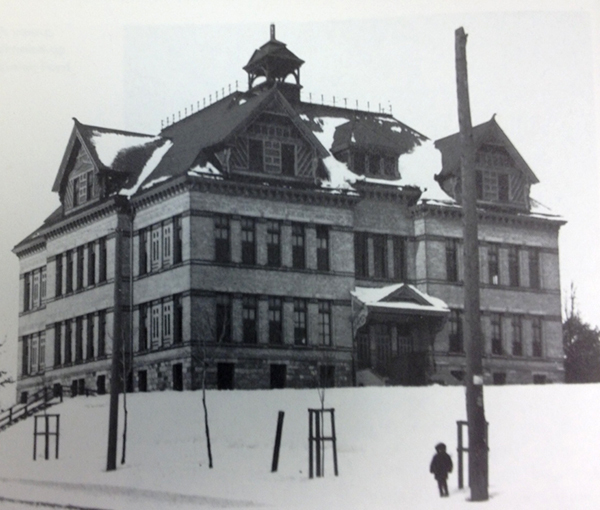 Ford began his education with kindergarten at this school in 1918. 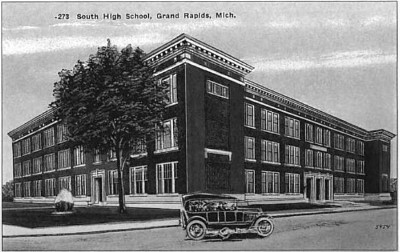 Gerald Ford attended school here from 1927 to 1931, leading the football team to a state championship during his senior year. Now located at 1815 Hall St. 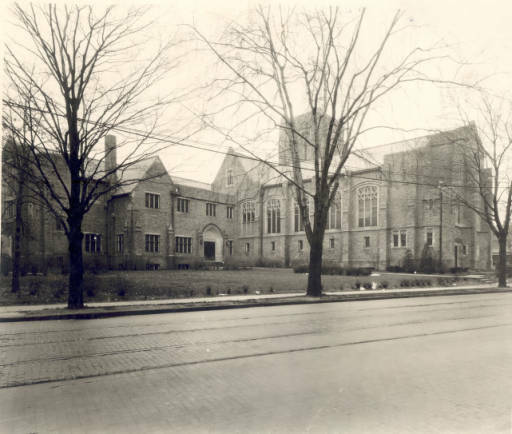 SE (as shown here), the church was located at the corner of Lafayette and Cherry when Dorothy King and Gerald Ford met there for the first time, perhaps as early as 1914. The Ford family moved to Santa Cruz drive in 1933, where they stayed till 1948. Jerry would call this home during college breaks. 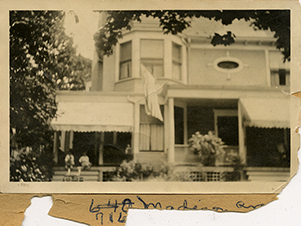 The Ford family lived here from 1930 through 1933. Jerry only lived here for part of his senior year of high school, but would come back on college breaks. 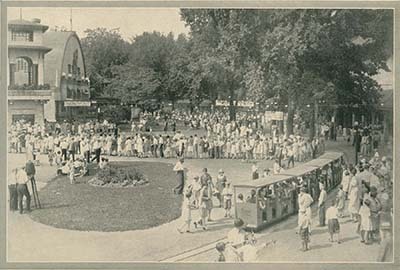 Here, where East Grand Rapids High School now stands, was an amusement park where Junior worked during the summers of his high school years. Photo courtesy of the Grand Rapids Public Library. Gerald Ford Sr. had this house built in 1922 after earning enough to move to the more affluent East Grand Rapids suburb. 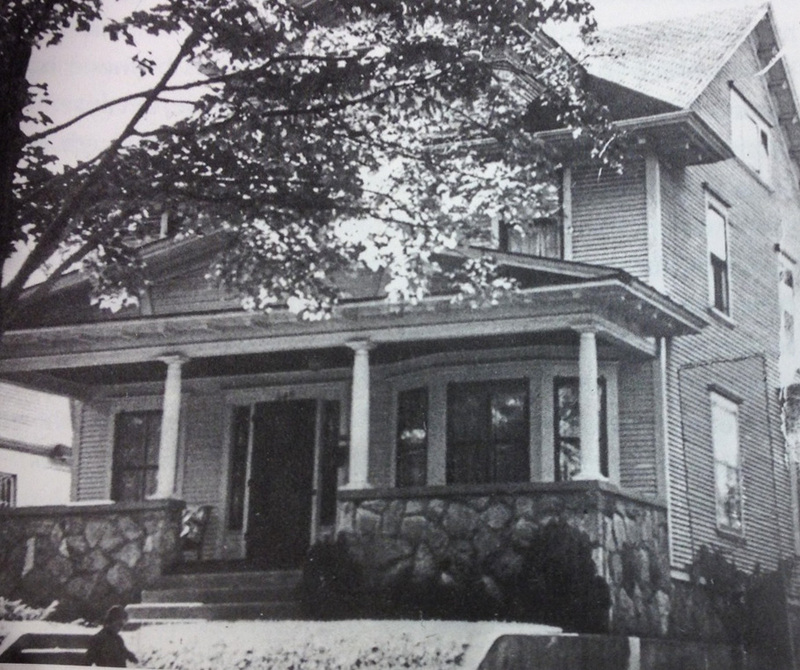 However, he lost his job in 1923, forcing the Fords to move to a different home on Union Avenue. Off Fountain Street, east of Central High, this football field hosted games from around the city, including many from South High, until South built a field of its own in 1930. 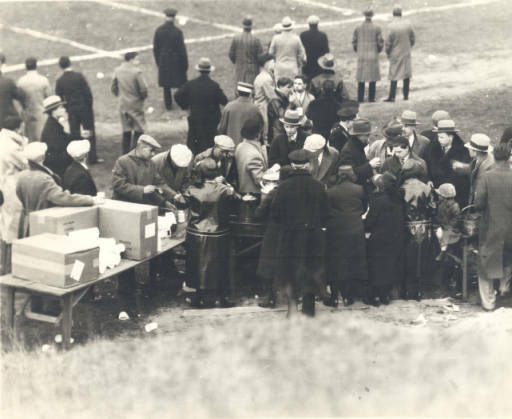 Photo (sideline of a Houseman Field game) courtesy of the Grand Rapids Public Library. At 1100 Lake Drive SE, Junior met here with Boy Scout Troop 15, earning his Eagle Scout rank in 1927. 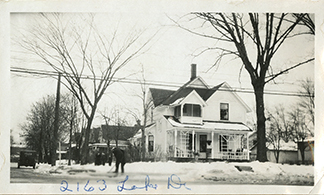 Photo courtesy of the Grand Rapids Public Library.